This is the second article about using the Vetiver System to help build community resilience in these uncertain times when many communities can expect little support from government or others to deal with increasing problems created by climate change, continuing poverty, and very limited financial resources. As noted in Part 1 most rural people in the tropics and semi arid areas are poor, and, even when out of poverty, most are unable to manage the environmental crises that currently, and in the future, will confront them. 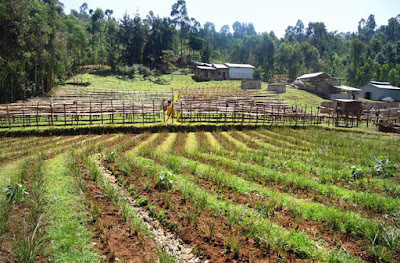 Most communities worry about being able to make a decent living from their small farms or businesses, they worry about the quality and availability of their water supply, they worry about potential disasters that may isolate them from neighboring communities and services, they worry about educating their children, and they see continuing and unabated health challenges often linked to environmental and social mismanagement. These concerns are magnified because most communities lack access to low cost technologies that might help them overcome some of their problems. The Vetiver System (VS) is one of a number of technologies that can help them. VS is low cost, relatively simple to understand, safe, and over the past 30 years is well proven. The Vetiver Grass Technology, (VGT) used for decades by farmers in south India as a tool for soil conservation, was reintroduced and "institutionalized" by John Greenfield of New Zealand whilst he was working for the World Bank in India in the 1980s. 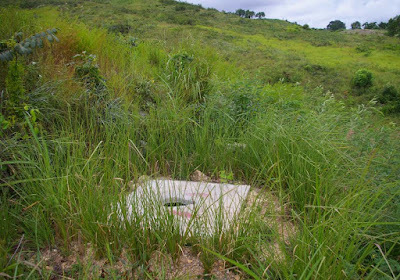 At that time the objective was to establish VGT as a more appropriate erosion control technology than the traditional engineered contour bunds. Later VGT formed the basis of a number of other applications that collectively are known as the Vetiver System (VS), these will be reviewed in future posts to this blog. This article discusses the application of VGT for sustained and improved water supplies that meet community needs. The availability of water and its quality has become of prime importance to sustaining human and animal life on our planet. This is of primary importance to many poor communities, both in urban and rural areas. A more reliable supply will reduce risks and costs, and for farmers assure crop and livestock benefits. VGT hedgerows as noted in part 1 will increase soil moisture and will enhance groundwater. Hedgerows reduce rainfall runoff by as much as 70%, and provide, by some estimates, 20% recharge of ground water. Reduced runoff and recharge results in better down catchment flows, stronger spring flows, sustainable well water supplies, and fuller surface reservoirs. The following two images from Anno Farm in Ethiopia show oozing spring lines and a perennial flow of water due mainly to the enhanced recharge associated with 250km of vetiver hedgerows planted on the adjacent upslope 500 ha of farmland . 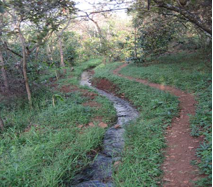 VGT hedgerows applied at catchment level reduce the impact of catastrophic rainfall events, spreading out and slowing down runoff; the consequential reduction of erosion not only benefits farmers but also reduces sediment flows downstream and the economic costs related to that sediment. It should be noted that the majority of farmers (98%) depend primarily on rain for crop and animal growth, they will never have access to major irrigation supplies, and those that do, can expect declining levels of availability, so it is essential to harvest rainfall insitu – where it falls – VGT is one of the better technologies to enable this. 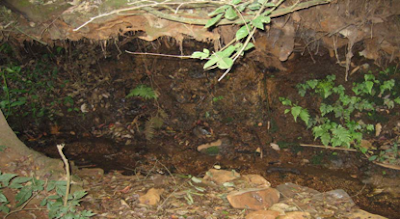 increased soil fertility, moisture and recharge of the springs in Figure 1. Water quality is the second big concern. Polluted water results from: (1) extreme weather events, that through flooding, discharge detriment, sediment, human, animal, and industrial waste to the water supply; (2) effluent generated by industry and mining, and from agriculture, and human domestic waste sources. Pollutants impact both surface and groundwater, and nearly always results in unsafe water supplies for both urban and rural communities. VGT is now well proven as a phytoremedial technology. Work initiated and led by Paul Truong of Australia some 20 years ago, and further developed by him and others, conclusively demonstrate and quantify the effectiveness of VGT to clean up polluted water that in most cases meet EPA standards. 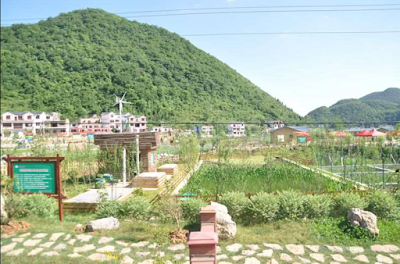 VGT for phytoremediation can be applied at large scale for major and complex applications for rehabilitation of mining and industrial sites, land fills, public sewage systems; and to micro applications for effluent clean up from community or individual septic, sewage treatment, and other waste water systems. These applications all rely on Vetiver grass’s unique ability to tolerate and remove high levels of toxic substances such as lead, arsenic, copper; and the removal of extreme levels of nitrates, phosphates, and agricultural chemicals. The technology can be used over a range of applications including in ground hedgerows (protection, rehabilitation and absorption buffers used in mining, landfills, and agriculture); constructed wetlands (domestic sewage processing at scale, agricultural animal waste, small individual septic systems); rain gardens (to clean up incidental urban and semi urban runoff); and as floating vetiver platforms on waste water disposal ponds (for the removal of heavy metals, nitrates, phosphates, and BODs). 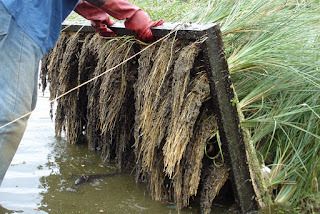 There are now some excellent examples of VS being incorporated as part of engineered wastewater treatment systems. The above images are from a presentation by Ziyuan Feng of Guangzhou Vetiver Grass Industry Science and Technology Company of a complete waste water collection and treatment process for a small village community. Small and poor communities can use some of these applications to help mitigate at micro-scale some of their immediate needs – such examples include stream bank Vetiver buffers (reducing sediment and toxic agricultural chemicals, and effluent flowing to drainage line), vetiver protected pit latrines (see this construction guide), Vetiver hedgerow protected springs, community processing plants as in the case of treatment of effluent from wet processed coffee that had previously been discharged directly into streams polluting community drinking water. This initiative came through a partnership between Ethiopia, Technoserve, and Mother Parker Coffee. 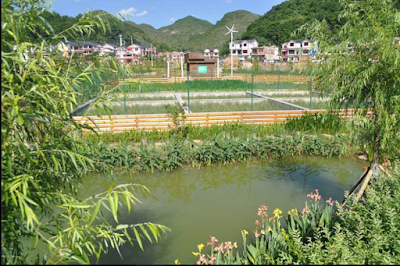 See "Transforming communities through water"
In urban areas polluted water from open drains and household effluent can often be routed through special vetiver constructed wetlands. See this case of building urban resilience by Alois Kennerknecht in Lima, Peru – an extraordinary demonstration how one man with commitment and a shovel can help a poor urban community. 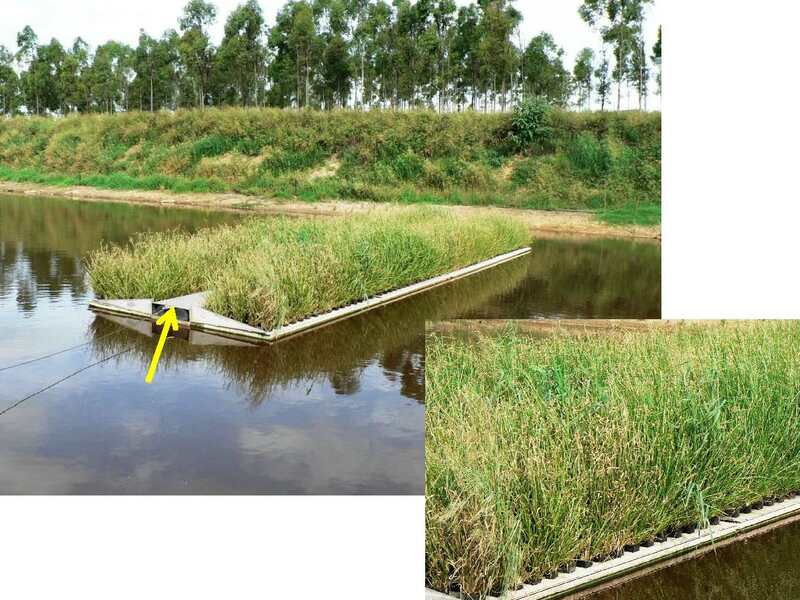 The presentation includes a nice example (Figure 9) of a vetiver constructed wetland cell used to treat the effluent from a single family household. Community water supplies, such as village tanks/ponds that have multipurpose uses (including religious) become overused and polluted. The water quality on such water bodies can be enhanced by using Vetiver on floating platforms and by protecting the sides of the ponds with Vetiver (filtration and stabilization). Many more examples backed by data and research are at TVNI website. 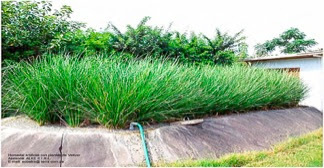 What is described in this post is how Vetiver, can if used properly, be of great value for community water development. In many cases a few lines of Vetiver will protect an important water supply, or may clean up dirty and smelly waste-water, or stabilize and reduce the effluent from a village garbage dump. A few Vetiver plants around a simple pit latrine will help reduce disease, and a few plants on a floating raft will make community water supplies more fit to consume. All of this is in reach of poor communities at minimal cost – as in Peru all that is needed is “knowhow and a shovel”!